This record was in the same 50 cents bin that the Trio Harmonie 45s came from. After I enjoyed jazz played an the harmonica I thought I might also give the zither a chance. The zither is mainly associated with traditional folk music, but the most famous and commercially successful zither song is still a pop song : The Harry Lime Theme, also known as The Third Man Theme, written and recorded by Anton Karas for the 1949 film The Third Man. 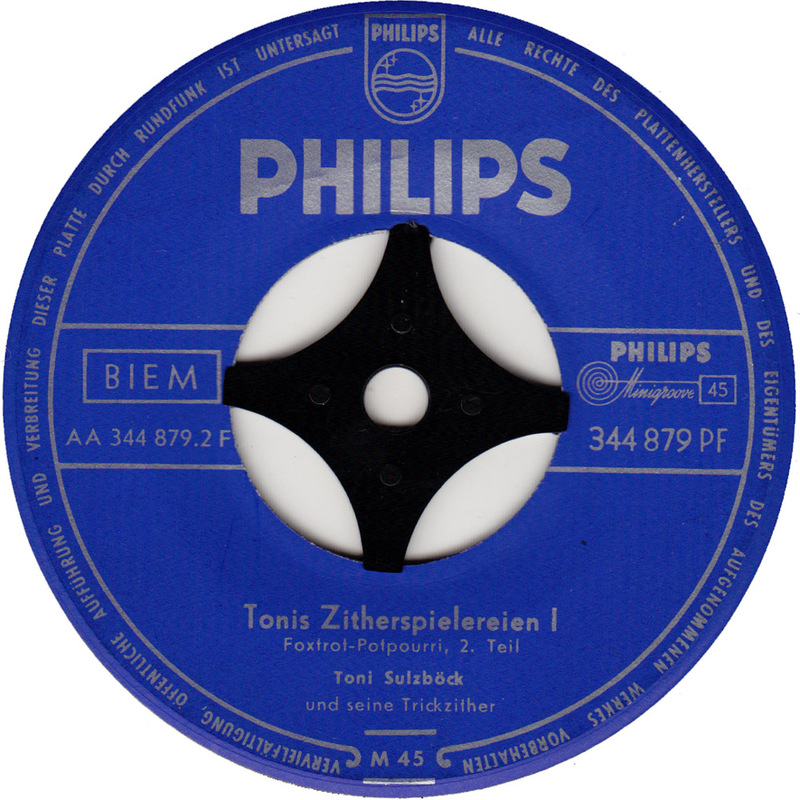 Toni Sulzböck led his own group in the 60s and 70s and regularly appeared on German television accompanying various artists. Although as a zitherist Toni primarily played traditional material, he also wrote and produced more pop oriented songs for other artists. 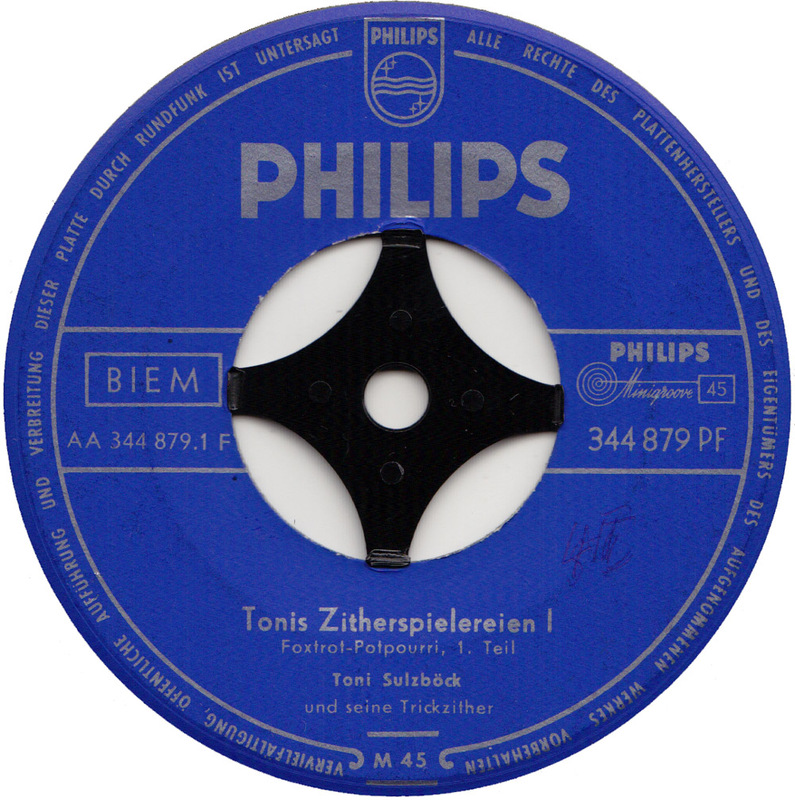 This medley record, probably one of Toni Sulzböck´s first, is surprisingly swingin´, because, the medleys are based on swing songs from the 1930s and 40s. Obviously influenced by Les Paul´s innovative production techniques, Dieter Resch experimented with his guitar tricks in East Germany, while Toni Sulzböck tried the same on his zither over in Bavaria. I think he displays an unusual pop sensibility on these two sides. This is zither music for dancing.